As students return to Carl Sandburg College this semester, they might be taken aback by a new look to one part of the campus. The patio area and walkway that lines the north side of most of the buildings on the Main Campus are nearing the final stages of a complete renovation. Construction on the project began in late May, just after the end of the spring semester, and work by Aupperle Construction in Morton is expected to finish sometime during the early part of the fall semester. The renovation was wanted for beautification and needed for improved accessibility to the area that overlooks an inlet of Lake Storey. The patio’s previous setup featured asphalt sidewalks and flagstone pavers that were uneven in many spots and could create tripping hazards. It also made navigating the area difficult for people with disabilities. The updated space will have a smoother surface, made entirely of concrete, and portions of the patio will be stamped to give it a patterned look. The patio already was a popular place for students, faculty and staff to eat, read, relax or study, and the changes are expected to encourage that even more. The updated space will have more seating areas, and shade sails will be in place during warmer weather to provide for cool places to unwind. It will also have charging stations for phones and computers, and the area will feature improved accessibility to the College’s wireless network. It will also offer a bigger, better space for annual student life events that take place in that location — such as Fall Festival, October Bash, Movie on the Pond and Spring Fest — and could open the door to hosting more College or community events there. “It’s intended to make the area better looking and more used by pretty much everyone,” Gall said. While the patio is getting the biggest makeover, the project also includes a new sidewalk that stretches from the Student Center in Building B to Building F, which houses the gymnasium and theater. It also will feature the addition of a service road that goes from behind Building H all the way to the patio. When complete, it will bring a new “wow” factor to an area that was already considered the crown jewel of Sandburg’s campus. 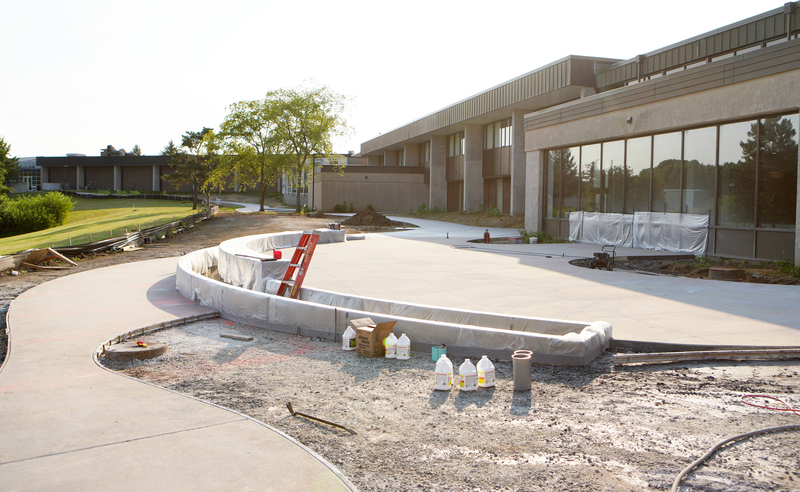 A renovation of the walkway and patio area on the Main Campus in Galesburg will provide a smoother surface made entirely of concrete and better accessibility for all individuals. The project is expected to be completed during the fall semester. 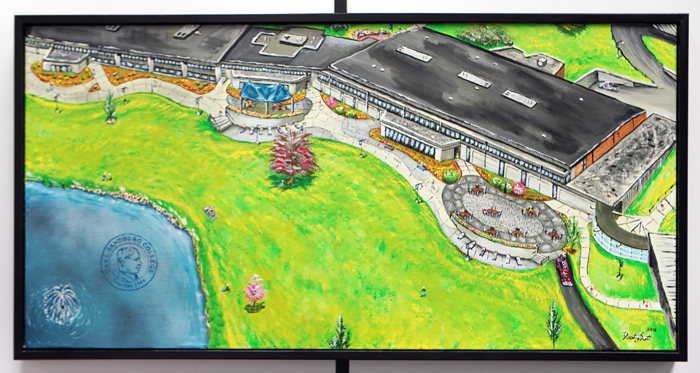 A concept painting by local artist Dusty Scott depicts an aerial view of what the renovated patio area on Carl Sandburg College’s Main Campus will look like when complete. Construction on the project began in late May and is expected to finish during the fall semester.